My friend, Aini told me that Osaka is a very beautiful city, so I can't wait to find out for myself. Since Japan is a very expensive country to go, we have to plan our trip itinerary carefully to avoid going overboard where budget is concerned. Why? Because transportation cost is quite high, and unlike in Malaysia, Japan has a lot of private railways and their travel pass options can be mind-boggling too! Like I previously mentioned, Japan was totally out of my radar, so I had no inklings of tourist attractions in Osaka. Heck, I didn't even know that Japan's Universal Studios are in Osaka, I thought it is in Tokyo! That to sum up how much ignorant I am about Japan. 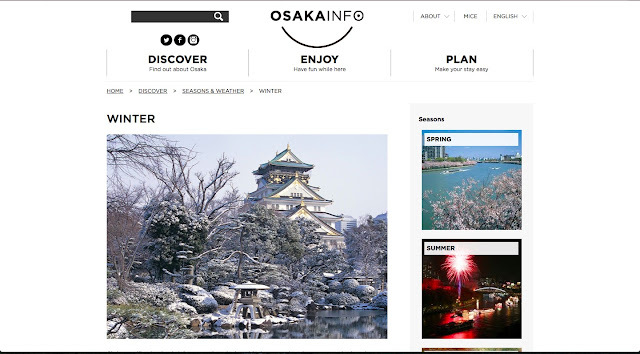 The photo shown in the website snapshot above is Osaka Castle during winter. A lot of websites and blogs say that this is a must-visit place, so visit we must. Note: Not sure whether we want to go into the museum... I was thinking of just taking photos from the outside of the castle or the castle ground (Osaka Castle Park). I don't want to risk my kids breaking anything in the museum! Dubbed the longest shopping street in Japan (2.6km), there are various kinds of shops here and the street itself looks fascinating! So this goes into our bucket list as well. One of the biggest aquarium in the world. Since I'm travelling with the two girls, our itinerary also includes activities for them. The girls enjoyed their Aquaria KLCC experience, so I think they will love to go to a giant aquarium to see an even bigger fish, the whale shark! There is a special travel pass (price: 2550¥/adult) for Kaiyukan (Osaka Kaiyu Ticket) which bundles the train ride to Kaiyukan area with the admission fee to the Aquarium (admission fee: 2300¥/adult, 600¥ for preschool age 4-6). Basically, it offers unlimited entries to the aquarium (within the day), discounts at the Bay area (Tempozan Giant Ferris Wheel discount 100¥/adult, normal fee: 800¥/adult) and unlimited rides on Osaka municipal transportation network (subway/new tramlines/city bus in Osaka City) on the same date. Note: Most likely, we will buy this Osaka Kaiyu Ticket since JR railway does not run through this area (total budget: 7650¥). This is the ultimate of our Japan trip! I think I'll be more excited than my kids going here LOL! My must-visit area shall be The Wizarding World of Harry Potter! Hopefully there's not so many people during our visit, since they shall enforce timed visit if there is a huge crowd. Admission fee: We managed to get birthday rate (since the girls' birthday is this month) and total ticket prices (in RM) for 3 adults & 2 kids are just RM800+ (if there's no discount, the normal price is about RM900+). Since we have limited time once we reach Osaka (only two days! ), I might squeeze in a trip to Osaka fish market (Osaka Central Wholesale Market). I just want to soak up the experience of being in one of the busiest fresh produce market and of course, watch the tuna fish auction (but I read we have to be very very early as in 4am if we want to catch them in action!